Monuments like the Red Fort, Qutub Minar and Humayun’s Tomb are on everyone’s must-visit list when travelling to Delhi. But the capital has so many other structures which are often left ignored by everyone from authorities to residents and tourists, even though they have an equally important place in the city’s history. Here are 11 such monuments which definitely deserve a place on your itinerary when you visit Delhi. Khooni Darwaza, which means “bloodstained door”, was constructed by Sher Shah Suri, who established the Sur Empire after defeating the second Mughal ruler Humayun. He ruled North India for 16 years before Humayun recaptured the throne. During the Mughal period, Khooni Darwaza became notorious for exhibiting decapitated heads of criminals. Emperor Aurangzeb even put his elder brother’s head on display here after he revolted against his father Shah Jahan. This was also the site where the British shot three Mughal princes’ in cold blood after the rebellion of 1857. Adham Khan, the son of Emperor Akbar’s wet nurse and therefore his foster brother, was an officer in the king’s army. He was executed for murdering another general, considered to be one of Akbar’s favourites. Both Adham Khan and his mother were buried in the tomb before a British officer had the graves removed to set up his own residence at the place. The grave of Adham Khan was later restored but that of his mother never found its way back here. Quli Khan’s Tomb was initially the resting place of Adham Khan’s brother before Sir Thomas Metcalfe, a British civil servant, bought it from the Mughals. He converted the 17th-century mausoleum into a retreat and often rented it to honeymooning couples. The once beautiful structure now lies in a neglected corner of Mehrauli and is completely overshadowed by the popularity of the nearby Qutub Minar. Chor Minar or the “Tower of Thieves” was built in the 13th-century during Sultan Alauddin Khalji’s reign. It is believed that the tower once housed 225 windows where severed heads of criminal offenders were displayed to deter lawbreakers as well as to instil fear among the Sultan’s subjects. 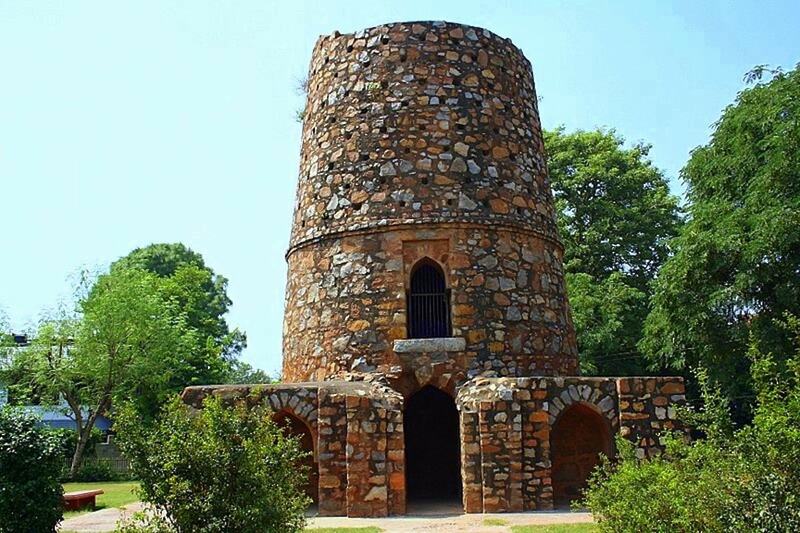 The dark history of the building has now been forgotten and the lawns surrounding Chor Minar are often used as a picnic spot by locals. The dilapidated mosque was an important place of worship during the Tughlaq dynasty’s reign over medieval Delhi. The mosque, which was also used as a fortress, has been inspired by both Muslim and Hindu architectural designs, a rare combination for the era in which it was built. Over the years, the building has lost both its shape and its importance. Modern Delhi is comprised of seven smaller cities built by different emperors who ruled at different periods of time in history. Ghiyath al-Din Tughlaq, the founder of Tughlaq dynasty, constructed one of these seven cities called Tughlaqabad in the early 14th-century. While his tomb is well-preserved, the rest of the fortified city lies in ruins. It is said that the famous Sufi saint Nizamuddin Auliya laid a curse on Tughlaqabad after he was upset by the king. When someone mentions Feroz Shah Kotla today, more often than not, it’s the famous cricket stadium that comes to mind. The namesake fort next to the stadium was built in 1354 by Feroz Shah Tughlaq and many believe that the antiquated structure now houses genies who can grant wishes. There are people who still visit Feroz Shah Kotla Fort to pray and seek help from these spirits. Abdur Rahim Khan-e-Khanan may not be the most well-known figure from history today but he was a celebrated poet and an important minister in Mughal Emperor Akbar’s court. Abdur Rahim was one of the most erudite noblemen and also known to be a master of languages. He is even said to have spoken some Portuguese. His mausoleum, commonly known as Khan-e-Khanan’s Tomb, lies very close to Humayun’s Tomb and Nizamuddin Dargah. Emperor Aurangzeb, who revolted against his father and elder brother to siege the crown, was the last powerful Mughal ruler. He ruled India for 49 years and after him the great Mughals were never able to restore their former glory. Aurangzeb had two coronation ceremonies, a grand one at the Red Fort and a more modest one at Sheesh Mahal. It is hard to imagine that such a historic place now lies in such a rundown state. Gandhak ki Baoli is a one of the oldest stepwells in Delhi built somewhere between 1210 and 1235 AD. The story goes that Sultan Iltutmish once met Saint Qutub Sahib and noticed that the latter hadn’t bathed for a long time. When asked why, the saint said he had no place to wash himself. Hearing this, Iltutmish gave the orders for the construction of Gandhak ki Baoli. Alhtough the water in the well is quite dirty, people still tend to use it. Unfortunately, there’s also a garbage pit next to the old structure. Qudsia Begum was the mother of Mughal emperor Ahmad Shah Bahadur, who succeeded the throne at a time when the empire was on a steady decline. The 18th-century mosque was part of a garden complex built for Qudsia Begum, but most of the structure has now fallen apart, mostly due to neglect. Mughal monuments like the Red Fort, which are much older than this one, still stand in good condition.